Twitter users actively engage in auto conversations at all stages of the car buying journey – starting long before they’re officially in-market and continuing well after purchase. They talk about their dream cars, express purchase intent, learn about new models and features, field recommendations, directly interact with brands and often share unsolicited reviews. Twitter partnered with Compete (@Compete) to get a better understanding of how Tweets from auto manufacturers and dealerships influence potential buyers in the US. Between September and November of 2012, the “Tweets in Action: Auto US” study found that exposure to Tweets increases the likelihood for users to take actions off-platform, including searching for car brands and engaging on owned or third party sites. In fact, users who saw a Tweet from an auto manufacturer were over 4x more likely to convert on lower funnel actions such as requesting a quote or looking for dealerships to test-drive. 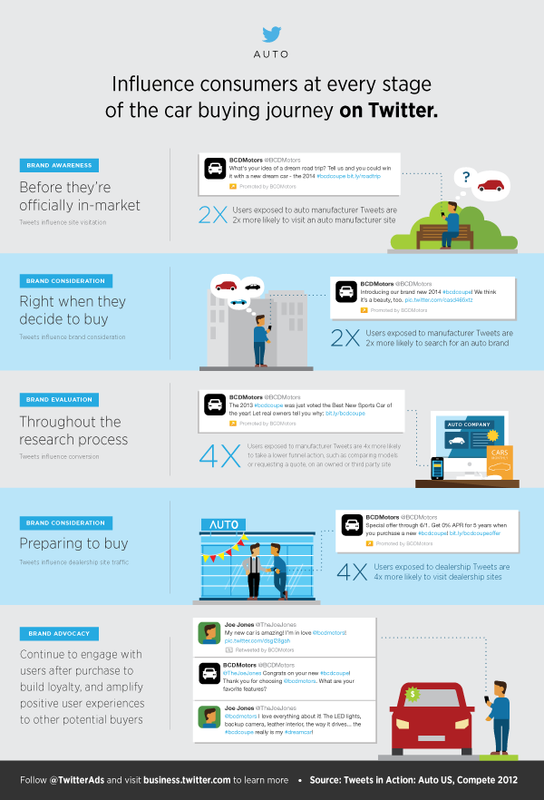 Download the infographic below to see how Twitter influences auto buyers at every stage of the car buying process. Compete observed the site visitation behavior of nearly 10,000 users to 360+ automotive-related sites (including those of manufacturers, dealers, aftermarket, and third party resources) from September through November of last year. The study looked at three different groups of users to understand the impact of their exposure to Tweets. The test group consisted of people who saw at least one Tweet from an auto brand. The control groups were made up of similar sets of users who did not see an auto Tweet. One was comprised of Twitter users and the other was representative of the average Internet user. For more insights, download the full whitepaper and follow @TwitterAds.